Though he was related to Italian nobility, Philip came from a poor family. His father, Francisco Neri, worked as a notary. Philip's brother died in childhood, but his two sisters, Caterina and Elisabetta survived. Known as a pius youth, Philip was taught humanities by the Dominicans. The family moved to San Germano in 1533 to help some relatives with their business, and while there Philip would escape to a local Dominican chapel in the mountains. Having received a vision that he had an apostolate in Rome, Philip cut himself off from his family, and went there. He was befriended by Galeotto Caccia who took Philip in and paid him to tutor his two sons. Wrote poetry in Latin and Italian. He studied philosophy and theology, and when he tired of learning, he sold all his books and gave the money to the poor. Philip began to visit and care for the sick, and impoverished pilgrims, and founded a society of like-minded folk to do the same. He became a friend of Saint Ignatius of Loyola. A layman, he lived in the city as a hermit. During Easter season of 1544, while praying in the catacomb of San Sebastiano, he received a vision of a globe of fire that entered his chest, and he experienced an ecstasy that physically enlarged his heart. With Persiano Rose, he founded the Confraternity of the Most Holy Trinity. He began to preach, with many converts. In 1550 he considered retiring to the life of a solitary hermit, but received further visions that told him his mission was in Rome. Later he considered missionary work in India, but further visions convinced him to stay in Rome. He entered the priesthood in 1551. Father Philip heard confessions by the hour, could tell penitents their sins before they confessed, and had the gift of conferring visions. He began working with youth, finding safe places for them to play, becoming involved in their lives. Pope Gregory XIV tried to make him a cardinal, but Philip declined. His popularity was such that he was accused of forming his own sect, but was cleared of this baseless charge. In 1575 he founded the Congregation of the Oratory (Oratorians, a group of priests dedicated to preaching and teaching, but which suffered from accusations of heresy because of the involvement of laymen as preachers. In later years he was beset by several illnesses, each of which was in turn cured through prayer. Daughter of Don Girolamo Flores Zenel de Paredes, a nobleman of Toledo, and Doña Mariana Cranobles de Xaramilo; her birth was accompanied by unusual celestial phenomena. Orphaned very young, she was raised by her older sister and her husband. Mary Ann was a pious child with a devotion to Mary. She was miraculously saved from death several times. Attracted to religious life at an early age, at ten she made vows of poverty, chastity, and obedience. She initially wanted to be a Dominican nun, but instead became a hermit in home of her sister. Her life changed at that point, and except to attend church, she never left the house again. Given to severe austerities, she slept little, and ate an ounce of dry bread every eight or ten days, surviving solely on the Eucharist which she received during daily Communion. Given to ecstacies; had gifts of prophecy, remote viewing, reading of hearts, healing by making the Sign of the Cross or sprinkling with holy water, and at least once restored a dead person to life. During a series of earthquakes in 1645, and inevitable epidemics that followed them, in Quito, Ecuador she publicly offered herself as a victim for the city and died shortly after. Immediately after her death there blossomed a pure white lily from her blood. The Republic of Ecuador has declared her a national heroine. Title given to the Blessed Virgin Mary who appeared in an apparition on 26 May 1432 in the countryside outside Caravaggio, Lombardy, Italy. Giannetta de' Vacchi Varoli was cutting hay in a field when the Virgin appeared. Mary requested penance from and a chapel built by the locals. A new spring of healing water appeared in the hay field. The apparition anniversary became a day of pilgrimage to the shrine of Santa Maria del Fonte built at the site, and devotion to the Madonna of Caravaggio spread through the region and eventually around the world. In 1879, Italians from Lombardy built a chapel for their settlement in southern Brazil. As it was the only sacred art that any of them possessed, they dedicated the chapel to the Madonna di Caravaggio. Today the shrine hosts over a million pilgrims annually. Converted to an active faith after hearing the preaching of Blessed Ambrose Sansedoni. 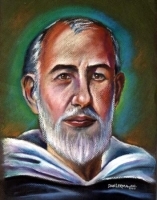 He felt drawn to religious life, and joined the Servites, received into the order by Saint Philip Benizi. Noted for his personal holiness, and his skill has a mediator. Studied at the Dominican convent of Santa Maria Novella in Pistoia, Italy as a boy, and joined the Dominicans there at age 14. Great preacher and evangelist. Prior of the Dominican houses in Pistoia, Lucca and Orvieto in Italy. Bishop of Pistoia, Italy in 1382; his ministry to the poor and sick led to his title of Father of the Poor. Miracle worker, including ending an epidemic of the Black Death. After 18 years of service, ill health forced him to retire from his see and return to life as a prayerful monk at the monastery in Pistoia. His mother died in childbirth. Raised by the Benedictine monks of Lérins Abbey from age 12, Lambert entered the Order at age 14. Reluctant bishop of Vence, France in 1114; he did not want to give up his life in the monastery, but accepted and served for 40 years. He built hospitals, supported widows and orphans, and would routinely retire to a small forest hermitage for periods of silence and prayer. He was a man of such obvious piety, honesty and charity that civil authorities would submit matters to him for arbitration without further appeal. Joined the Dominicans in 1697. Ordained on 24 September 1704. Missionary to the Philippines in 1712. Missionary to China in 1713. Co-adjutor vicar apostolic of Fo-Kien, China on 29 January 1728. Bishop co-adjutor and titular bishop of Mauricastro on 24 February 1730. Vicar apostolic of Fujian on 3 January 1732. Imprisoned for his faith and his work in 1746. 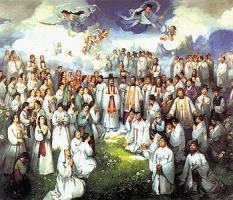 Married layman in the apostolic vicariate of Korea. Pharmacist. Convert. Imprisoned, tortured and left to die in prison for his faith. Martyr. Priest in the apostolic vicariate of North Cochinchina (in modern Vietnam) who worked to evanglize his countrymen. Martyred in the persecutions of Emperor Tu-Duc. Son of Habundius. Deacon under Pope Anicetus and Pope Saint Soter. Chosen 13th Pope c.174. Declared opposition to Gnostics and the Montanists. Sent Fugatius and Damjan to convert the Britons. Abolished some Jewish dietary customs for Christians. Martyr. Bishop of Athens, Greece; his background in Greek literature helped him become quickly accepted even by the pagans in his diocese. First person to write an apology for Christianity, addressed to Emperor Hadrian c.124. He is quoted in works by Saint Eusebius and Saint Jerome, and he is mentioned in early martyrologies. Born to the Nnyonyi Nnyange clan. Soldier. Convert. One of the Martyrs of Uganda who died in the Mwangan persecutions. Educated in Vienne, France and a noted classics scholar, he became an Archdeacon and then Bishop of Vienne. Exiled and deposed for his defense of orthodox Christianity, he returned only to be assassinated. Martyr. Convert, joining the Church in 1881. One of the Martyrs of Uganda who died in the Mwangan persecutions. Benedictine monk at the monastery of Saint-Papoul, Toulouse, France. A model of the monastic life, and miracle worker. Second century missionary from Rome, Italy to the British Isles, sent by Pope Saint Eleutherius at the request of King Lucius. Apparently worked in south Wales to judge by the churches dedicated to him. Simitrius and 22 fellow parishioners, whose names have not come down to us, were grabbed and summarily executed for their faith while at prayers. Martyrs. Nun. Abbess of Nonnberg Abbey near Salzburg, Austria. Officer in the imperial Roman army. He along with several of his soldiers and some citizens of Besançon, France were martyred for their faith. Born to the Scottish nobility. Governor of the province of Laudon. He gave up his wealth and status to become a monk and then abbot at Melrose Abbey. Benedictine monk at Monte Cassino. After the destruction of the abbey there, he spent the rest of his life as a hermit on the mountain. 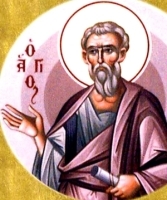 Father of Saint James the Less, as mentioned in Matthew 10:3 (...James, the son of Alphaeus...). Confessor of the faith. 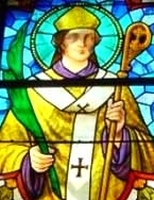 Second bishop of Vienne, France. Martyred in the persecutions of Trajan. Sixth-century hermit near Cork, Ireland. Martyr. Saint Augustine of Hippo wrote about him.